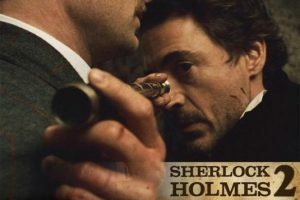 Sherlock Holmes 2 Discovers Its Title!!! E! Online reported the new Sherlock Holmes sequel has found its title. And no, it won’t be called Sherlock Holmes 2: Electric Boogaloo. It will be called Sherlock Holmes: A Game of Shadows. Your thoughts? Sherlock Holmes: InnnnnSpaaaaaaaaace!!?? Ben Affleck Could Become ‘The Accountant’ Again!!! Warner Bros. Is Developing ‘Space Jam 2’!! This entry was posted on Wednesday, February 16th, 2011 at 10:34 am	and is filed under Film, News. You can follow any responses to this entry through the RSS 2.0 feed. You can skip to the end and leave a response. Pinging is currently not allowed. « COMIC BOOK RELEASES FOR THE 3rd WEEK OF FEBRUARY!!! Therefore, I shall resign the presidency effective at noon tomorrow. Vice president Ford will be sworn into office at that hour in this office.